The snow has melted! Spring is in the air (well, some days it is) and it’s time to come out of your winter hibernation and take advantage of the many resources and events Peirce College has to offer this spring. 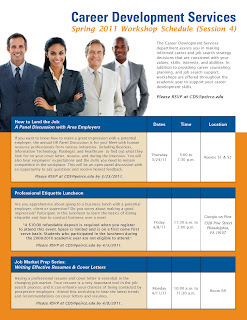 Check out the flyers below for upcoming workshop dates and details from Career Development Services (CDS) and The Walker Center for Academic Excellence. Both departments provide a wide variety of student support services to help you make the most of your academic experience and career development at Peirce. 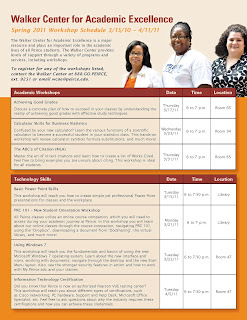 If you are interested in attending any of the CDS workshops scheduled for March and April 2011, please R.S.V.P. by calling 888.GO.PEIRCE, ext. 9202, or sending an e-mail to the CDS team. As always, if the workshop you need is not available or if you can't attend one of the scheduled sessions, you can always contact the CDS Center to make an appointment with a counselor for a one-on-one session. To register for any of the spring Walker Center workshops or find out about additional services such as tutoring, disability services, or academic counseling, e-mail The Walker Center or call 888.GO.PEIRCE, ext. 9251.